Purpose: Chronic cerebral ischemia is a common pathological state, which can lead to cognitive disorder and neurological dysfunction. Aminoguanidine is a selective iNOS inhibitor which can improve acute cerebral ischemia, however its protective effect against chronic ischemic neurological damage remains to be researched. This study analyses the effect of aminoguanidine intervention on hippocampal pyramidal cell dendrite morphological change and spinophilin expression of rats with chronic cerebral ischemia, so as to explore its cerebral protection mechanism. Method: Prepare chronic cerebral ischemia model, conduct aminoguanidine lavage intervention, and then evaluate behaviors of each group of rats through Morris water maze at the 2nd, 4th, 8th week, respectively. Conduct Golgi stain, and observe branching and length change of hippocampal pyramidal cell dendrite; conduct immunohistochemical method to test spinophilin expression of each group of rats. Results: SD rats were randomly divided into sham-operated group, model group (2VO group), and intervention group (aminoguanidine group). Compared with sham-operated group, the branches and length of hippocampal pyramidal cell dendrite of rats in model group at the 4th and 8th week were significantly reduced (P<0.05), and the spinophilin expression of model group was significantly reduced (P<0.05), showing a progressive behavioral and cognitive dysfunction; Compared with model group, the dendrite branches and length, and spinophilin expression of intervention group were significantly increased (P<0.05). Conclusion: Aminoguanidine can promote hippocampal pyramidal cell dendrite morphological change and increase spinophilin expression of rats with chronic cerebral ischemia. Through such approach, it can improve chronic cerebral ischemia anoxic condition and the damage process of hippocampal pyramidal dendrite and dendrite spine, maintain normal transmission of synapse, so as to exert brain protection effect and improve cognitive disorder caused by chronic cerebral ischemia. Aminoguanidine, Chronic cerebral ischemia, Dendrite, Spinophilin, Golgi stain. Chronic cerebral ischemia or cerebral hypoperfusion often accompanies during pathological process of cerebrovascular diseases such as cerebral arteriosclerosis, vascular dementia, Alzheimer disease, Binswanger disease, arteriovenous malformation, and Moyamoya . The disease caused by histologic changes of hippocampal and prefrontal cortex neurons and cholinergic system change is mainly manifested as cognitive impairments in early stage [2,3], and finally may manifested as lasting or progressive cognitive and neural dysfunction [4,5]. As an important component of cerebral limbic system, hippocampus is closely correlated with learning  and memory . Owe to the specific composition of hippocampal blood vessel, hippocampus is an area which is the most sensitive to brain ischemia . Dendrite is the transmission entrance of neurons information. Dendrite spine is the original site for excitatory synaptic transmission . Hippocampal ischemia can cause deficits in synaptic plasticity . Therefore, the morphology of hippocampal pyramidal cell dendrite and plasticity of dendrite spine are the cellular basis for learning and memory . Spinophilin, locating on dendrite spine, is a multi-functional protein for regulating membrane and cytoskeleton, which plays a key role in central nervous system , and is closely related with morphological adjustment and number of dendrite spines, synapse formation, and neuronal migration . The production of NO (nitric oxide) accompanies with physiological and pathological changes of ischemic neurological damage . AG (Aminoguanidine) is a selective NOS (inducible NOS, iNOS) inhibitor. Former researches show that AG can improve nerve cell damage caused by acute focal cerebral ischemia  and cerebral ischemia , showing sound therapeutic effect [17,18]. However, researches on chronic cerebral ischemia brain damage are very few. In this experiment, by establishing common carotid arteries vessel occlusion (2VO) rat model [11,19], we observed branch length of hippocampal pyramidal cell dendrite and expression change of spinophilin under aminoguanidine intervention and its influence to rat's learning ability, and explored it’s possible neuroprotective effect. 60 healthy SD female rats, aged 5 months old, with weight varying within 320-350 g, provided by Medical Experiment Center of Zhengzhou University. AG (Sigma, USA), rabbitanti spinophilin (Upstate, USA), immunohistochemical kit (Beijing Zhongshan Biological Engineering Co., Ltd.), DAB kit (Beijing Zhongshan Biological Engineering Co., Ltd.). Inverted microscope (DMI4000B, Leica, Germany), KD-400 vibratome, and Morris water maze instrument. Divide 60 SD rats into shan-operated group, model group (2VO group), and intervention group (AG group), each containing 20 rats. Cerebral ischemia rat models (2VO) were prepared by permanent ligation of bilateral common carotid arteries . Before operation, keep rat foods fasting for 12 h and water fasting for 4 h. Conduct intraperitoneal injection of 10% chloral hydrate (0.3 ml/100 g) for anesthesia, and guarantee rats have spontaneous breath during operation. Keep the rat in supine position and fix it, unhair anterior region of the neck, sterilize it, cut along middle line the neck, carefully separate common carotid arteries, and respectively ligature common carotid artery near end and distal end to block carotid artery blood flow, finally suture the skin. During operation, keep rectal temperature of rats within 36.5°C~37.5°C. After operation, deliver rats to animal feeding room with ventilation and air conditioning equipment. The operation process for sham-operated group was roughly the same with model group, except for permanent ligation of bilateral common carotid arteries that was not conducted. After successfully constructing model, the intervention group was subjected to daily intragastric administration of aminoguanidine solution by dosage of 150 mg.kg-1.min-1; while model group and sham-operated group were subjected to intragastric administration of normal saline by equal dosage. Observe the three groups at the 2nd, 4th, 8th week. From the postoperative 2nd, 4th, 8th week, place each group of rats in Morris water maze for navigation training for consecutive 4 d, each day included 3 trainings, and each training lasted for 120 s with a unique entry point. If the rat finds platform within 120 s, keep it stay on platform for 15; while if fail to platform within 120 s, induce it to step on platform and stay for 15 s, and then the whole process of one training is considered finished. Keep training for 4 d by such procedure, record each rat's incubation period. The shorter the incubation period is, the nearer the distance is, indicating the better the learning and memory ability is . Take the escape latent period of rat of sham-operated group at the 4th day as reference value. Calculate the ratio (the escape latent period of model group rat at the 4th day-reference value)/ average escape latent period of the model group rat. If such ratio>20%, it is believed to be rat with cognitive disorder, i.e. successfully modeled rat . Randomly take half amount of each group of rats, and quickly perfuse Golgi stain materials  at the 2nd, 4th, 8th, respectively (for model group, the successfully modeled rats were selected). Quickly perfuse 0.5% sodium nitrite liquid till discharge liquid is bloodless. Perfuse 10% formaldehyde solution for fixation, allowing it to fully replace former liquid, and then wait for 1-2 h. After that, slowly perfuse mordant dyeing (5% chloral hydrate, 5% potassium dichromate, 10% formaldehyde) till the discharging dark orange liquid, and the wait for 1-2 h. Open skull and take out hemicerebrum, take 8 mm long tissue block from anterior 1/3 site to backward, immerse it in mardant dyeing, place it in 37°C incubator which was placed in dark area for 24 h. Subsequently, immerse the tissue in 1% silver nitrate solution for silver plating, place it in 37°C incubator which was placed in dark area for 3 d (change new silvering liquid every day). Conduct serial section of hippocampus coronary using vibratome (slice thickness was 100 μm). Successively wash the slices with 2% potassium bichromate solution and distilled water, and then subject it to dehydration, transparency, sealing, and microscopic observation. Collect images and analyse them using ImageJ software. Of all sections of one rat, select 5 sections with clear hippocampus and uniform thickness of dyed vertebral neurons. For each section, measure 4 cells of morphological integrity. For each group, observe 80 cells. Take the other half amount of each group of rats, and quickly perfuse normal saline via rats' hearts till the discharging liquid becoming clearer. Perfuse 10% formaldehyde solution and fix it, open skull and take out hemicerebrum, take 8mm long tissue block (including hippocampus) from anterior 1/3 site to backward, then fix it in 4°C refrigerator for 24 h. After that conduct dehydration in gradient alcohol, paraffin embedding; prepare paraffin section of brain coronary in thickness of 4 μm. Use PBS to wash sections 3 times, each time immersing for 5 min. Drop 3% H2O2 at room temperature for 20 min, and the wash with PBS 3 times, each time immersing for 5 min. According to operations prescribed in SP kit instruction, develop color in primary antibody (rabbit-anti spinophilin, 1:500) and Dimethylbenzene Benzidine (DAB), control coloration time under microscope, conduct dehydration in gradient alcohol, perform xylene transparency, and seal section with Neutral balsam. Select 5 sections for each rat, and select 5 views of hippocampal area for each section, and then observe under microscope. Branching and length of dendrite: Use Sholl plug-in to record branching and length of dendrite. Under microscope in 200 times magnification, draw concentric circles by interval of 10 μm based on neuronal soma as center, and then calculate number of intersection points between dendrites and circles, so as to reflect the branching degree and length of dendrite, as shown in Figure 1. 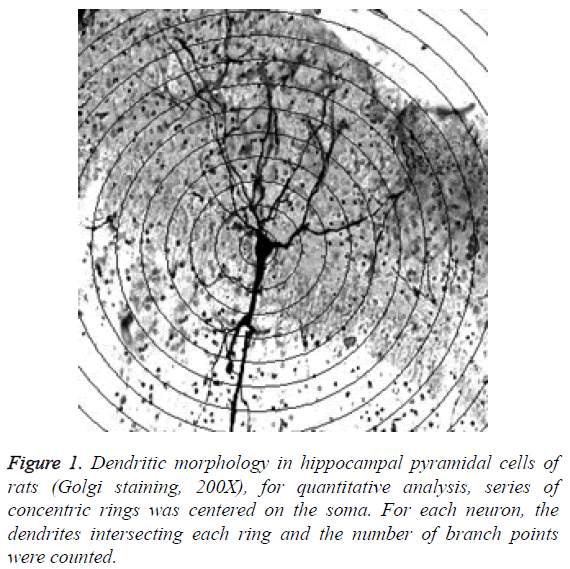 Figure 1: Dendritic morphology in hippocampal pyramidal cells of rats (Golgi staining, 200X), for quantitative analysis, series of concentric rings was centered on the soma. For each neuron, the dendrites intersecting each ring and the number of branch points were counted. Measurement of spinophilin expression: Each view was scored according to coloration, non-coloration, color darkness (a), color proportion (b). The results are the mean value of aggregate score (a × b). Spss15.0 statistical software was adapted to process data. All data were expressed in mean ± standard deviation (͞x ± s), multiple groups were compared by one-way analysis of variance, two groups were compared using LSD method, comparison of intergroup mean value was tested two-sample t, wherein α=0.05 is test criterion for statistical significance. As show in Table 1, the comparison of three groups of rats shows the latency period of model group is significantly longer, which is significantly different from sham-operated group (P<0.05), indicating that the rats in model group suffers damaged memory function and cognitive disorder in certain degree. With the extending of ischaemic time, the cognitive disorder is significantly worsened. Compared with model group, the latency period of intervention group is significantly shortened (P<0.05), indicating that cognitive function is recovered in certain degree. Compared with sham-operated groups, #P<0.05; Compared with model groups, ∆P<0.05. Table 1: Incubation period of rats in each group (͞x ± s, n=20). As shown in Table 2, there is no significant difference of intersection points number between model group and shamoperated group at the 2nd w, the intergroup comparison is of no statistical significance (P>0.1); the numbers of intersection points of model group at the 4th and 8th week are significantly decreased compared with those of sham-operated group (P<0.01). Compared with model group, the numbers of intersection points of intervention group at the 4th and 8th week are significantly increased (P<0.05). Compared with sham-operated groups, #P<0.05, ▲P<0.01, ○P>0.05; Compared with Model groups, ∆P<0.05. Table 2: Total number of branch points in each group (͞x ± s, n=80). As shown in Table 3, the spinophilin expressions of model group and intervention group are significantly lower than of sham-operated group (P<0.05). With the extending of time, the spinophilin expression of model group shows a gradual decreasing trend. The spinophilin expression of intervention group is significantly higher than that of model group (P<0.05). The spinophilin expression of intervention group at the 8th week is significantly higher than that of model group, not only in terms of more cells, but also in darker dyeing color (Figure 2). Compared with sham-operated groups, #P<0.05, ▲P<0.01; Compared with Model groups, ∆P<0.05. Table 3: Immunohistochemical results of spinophilin in each group (͞x ± s, n=80). Figure 2: Immunohistochemical results of Spinophilin in each group. Dendrite is a key area for neurons information reception, with function of receiving and integrating synaptic transmission. There are many spinous protuberance on the surface of dendrite, which is called dendritic spine where the synapse is formed. The branch of dendrite, dendrite length and dendritic spine can enlarge the neuron's surface area for receiving stimulation, which plays vital role in neurons information transmission . Chronic cerebral ischemia is a common pathological state of nervous system, which can lead to energy metabolism dysfunction and cognitive impairment. Tsuehiya et al. studied postoperative brain blood variation of rat 2VO and found that 1 week after operation, the hippocampal blood flow was reduced by 20%, brain cortex blood flow was reduced by 30%-45%, meanwhile the hippocampal glucose utilization rate was significantly decreased by 15%, and cortex glucose utilization rate was reduced by 20%-30%. From 8 weeks to 3 months after operation, the hippocampal blood flow was approximately reduced by 60%, and cerebrum low flow gradually became chronic state , accompanied by a series of pathologic changes such as neurotransmitter change, white matter damage, and neuron loss . Bennett et al. studied the nerve damaging mechanism of chronic cerebral ischemia, and found gradual apoptosis of nerve cells in hippocampal area of 2VO rats after operation, wherein the number of apoptosis was closely related with cognitive disorder. Due to the density distribution of blood capillaries, the hippocampal area is extremely sensitive to ischemia, and thus to be known as the most representative area for neuropathologic change. When performing task of spatial working memory, there is fixed time-phase synchronization phenomenon between local field potential and hippocampus electroencephalogram, which is closely correlated with process of spatial working memory . Other studies showed that hippocampus-prefrontal circuitry neural projection was the key for learning and memorial function . Therefore, it can be known that hippocampus is a sensitive area for brain ischemia and chronic cerebral ischemia can lead to pyknosis and apoptosis of hippocampal pyramidal cell and dendritic damage, and thus laying a pathophysiological basis for progressive cognitive disorder. The low cerebral blood flow change after permanent ligation of bilateral common carotid arteries (2VO) is very similar to aging-induced chronic cerebral ischemia, which has been widely used to study the influence of chronic cerebral ischemia to cognitive disorder. Morris water maze was proposed by British psychologist Morris in early 1980s. Through allowing rats to search the target in an opaque pool, he observed and researches the learning, memory, spatial position, and cognitive ability of rate with damaged hippocampus, and achieved remarkable results. Therefore, Morris water maze has become an important experiment method for analyzing spatial learning and memory ability of animals . Dendritic spine is a highly dynamic protuberance structure on subsynaptic membrane and distributed along neuronal dendrites, each spine develops into a synaptic structure. The plasticity regulation of synapse is directly related to the composition of memory . Spinophilin, a nerve scaffold protein associated with plasticity regulation of dendritic spine , varies with the shape and density of dendritic spine during synaptic transmission. In early researches, Spinophilin has been regarded capable of maintaining the stability of actin cytoskeleton during morphological change of neuron dendrites . Afia et al. evaluated the number of Spinophilin immunocompetence miliary spines in hippocampus and cerebral cortex area 9 of elderly patients with different degrees of cognitive disorders, and found that the decrease of Spinophilin immunocompetence is closely related with neurofibrillary tangles the clinical cognitive disorder. Jia et al. found that under chronic cerebral hypoperfusion, dendritic morphologic variation occurred in hippocampal CA1 region and prefrontal cortex, the number of dendritic spines was significantly decreased, and the rats showed significant cognitive disorder. In our research, with the worsening of cerebral ischemia of rats at the 2nd, 4th, 8th weeks, the dendrite length, dendritic branching, and Spinophilin expression were in decreasing trend, moreover, it can infer the stability and number of dendritic spines were decreasing, which affects synaptic neurotransmission function, thereby causing decreased learning and memory ability. NO is a vasodilator. NOS (nitric oxide sgnthase) are a key factor for NO synthesis. The content of NO and biological action of NO are totally determined by the activity of NOS. As a inducible isoenzyme of NOS, iNOS is associated with physiological functions such as maintenance of nerve conduction and vasodilatation . Under pathological condition, high expression of iNOS will produce large amounts of NO, so that leading to the subsequent lipid peroxidation process may cause DNA breakage, neuronal apoptosis, and opening of brain blood barrier . Under electron microscope, it can observe AG can reduce cerebral microvessel structural damage, inhibit microvascular remodeling, and improve the number of cerebral microvessels . Torre et al. fount that the NO content in hippocampus of rat after 2VO operation was increasing for 2 w , leading to a significant nerve cell damage of rats with chronic cerebral ischemia. As a selective inhibitor of iNOS, AG can inhibit NOS activity, reduce the number of iNOS, decrease production of NO, and thus reduce excessive NO-mediated excitatory amino acid toxicity, reduce the production of oxygen radicals, mitochondria damage, and calcium overload induced hypoxicischemic damage [15,36]. In this experiment, the intervention of AG was given to rats with chronic cerebral ischemia, and results showed that the length and branching degree of hippocampal pyramidal dendrite of intervention group were significantly higher than that of model group, the Spinophilin expression of intervention group was significantly increasing from the 2nd week to the 8th, and the latency periods of intervention group at the 4th, and 8th week were significantly shorted as compared with that of model group, i.e. the learning and memory ability was significantly improved. It can infer that AG can inhibit the number of active intracerebral iNOS, reduce the of toxic effect of high content of NO on hippocampal pyramidal cells, improve antioxidant function of mitochondria, reduce apoptosis rate of brain cells, improve hippocampal microvascular remodeling after chronic cerebral ischemia, stabilize the morphology of dendrite and dendritic spine, improve chronic cerebral ischemia anoxic condition, and the damage process of hippocampus pyramidal dendrites and dendritic spines, and maintain the normal transmission of synapse. AG can cause morphologic change of hippocampal pyramidal cell dendrites and enhance Spinophilin expression of rats with chronic cerebral ischemia, so as to exert cerebral protection effect. Therefore, AP is of great clinical value to be applied in treating cognitive disorder caused by chronic cerebral ischemia. However, it needs further study on whether AG can directly adjust morphology of dendritic spine as well as its action targets, in order to explore its maximum clinical treatment value. Kazumata K, Tha KK, Narita H, Kusumi I, Shichinohe H. Chronic ischemia alters brain microstructural integrity and cognitive performance in adult moyamoya disease. Stroke 2015; 46: 354-360. Alvarez-Sabín J, Roman GC. Citicoline in vascular cognitive impairment and vascular dementia after stroke. Stroke 2011; 42: 40-43. Tang Y. Study on cognitive impairment and mechanism causing by chronic cerebral hypoperfusion in rats. Sichuan Med J 2010; 31: 1226-1228. Xiao J, Cheng Y. Pathophysiological mechanisms of cognitive impairment caused by chronic cerebral hypoperfusion. Cerebrovasc Dis 2009; 17: 614-617. He J, Xiao MZ, Bo AZ. Dendritic morphology of neurons in medial prefrontal cortex and hippocampus in 2VO rats. Neurol Sci 2012; 33: 1063-1070. White NM , Gaskin S. Dorsal hippocampus function in learning and expressing a spatial discrimination. Learn Mem 2006; 2: 119-122. Oomen CA, Bekinschtein P, Kent BA. Adult hippocampal neurogenesis and its role in cognition. Wiley Interdiscip Rev Cogn Sci 2014; 5: 573-587. Ji X, Zhang X. A comparative study of hippocampal vasculature in both human and rat. Chinese J Neuroanatomy 2004; 20: 179-182. Tada T, Sheng M. Molecular mechanisms of dendritic spine morphogenesis. Curr Opin Neurobiol 2006; 16: 95-101. Wang S, Zhang J. Hippocampal ischemia causes deficits in local field potential and synaptic plasticity. J Biomed Res 2015; 29: 370-379. Jia H, Zhang B. Changes of dendritic morphology and spine density in hippocampal CA1 pyramidal cells of chronic cerebral ischemic rats. Chinese J Pathophysiol 2012; 28: 177-180. Futter M, Uematsu K, Bullock SA, Kim Y, Hemmings HC. Phosphorylation of spinophilin by ERK and cyclin-dependent PK 5 (Cdk5). Proc Natl Acad Sci USA 2005; 102: 3489-3494. Grossman SD, Futter M, Snyder GL. Spinophilin is phosphorylated byCa2+/ calmodulin-dependent protein kinase II resulting in regulation of its binding to F-actin. J Neurochem 2004; 90: 317-324. Fassbender K, Fatar M, Ragoschke A, Picard M, Bertsch T. Subacute but not acute generation of nitric oxide in focal cerebral ischemia. Stroke 2000; 31: 2208-2211. Wanglu Q, Jiajing E. Effect of L-arginine, aminoguanidine and agmatine on focal cerebral ischemia-reperfusion injury in rats. Chinese J Pathophysiol 2011; 27: 1213-1217. Zhang H, Zhang J. Effects of nitric oxide synthase inhibitors on focal cerebral ischemic injury in rats. Chinese J Pathophysiol 2002; 18: 679-682. Danielisova V, Nemethova M, Burda J. The protective effect of aminoguanidine on cerebral ischemic damage in the rat brain. Physiol Res 2004; 53: 533-540. Chang CP, Lee CC. Aminoguanidine protects against intracranial hypertension and cerebral ischemic injury in experimental heatstroke. J Pharmacol Sci 2004; 95: 56-64. Zhang X, Zhang B. Dendritic morphology of neurons in medial prefrontal cortex in chronic cetebral hypoperfusion rats. J Apoplexy Nerv Dis 2011; 28: 964-967. Dhooge R, De Deyn PP. Applications of the Morris water maze in the study of learning and memory. Brain Res Rev 2001; 36: 60-90. Yu J, Liu C, Zhang X. Acupuncture improved cognitive impairment caused by multi-infarct dementia in rats. Physiol Behav 2005; 86: 434-441. Du Z, Wei G. Practical histology technique. Peoples Health Publ H 1998; 143-144. Nimchinsky EA, Sabatini BL, Svoboda K. Structure and function of dendritic spines. Annu Rev Physiol 2002; 64: 313-353. Tsuchiya M, Sako K, Yura S, Yonemasu Y. Cerebral blood flow and histopathological changes following permanent bilateral carotid artery ligation in Wistar rats. Exp Brain Res 1992; 89: 87-92. Shu Y, Zhang H. Experimental research progress in chronic cerebral hypoperfusion. Chin J Cerebrovasc Dis 2010; 4: 199-206. Bennett SA, Teimiswood M, Chen JH. Chronic cerebral hypoperfusion elicits neuronal apoptosis and behavioral impairment. Neuroreport 1998; 9: 161-166. Jones MW, Wilson MA. Phase precession of medial prefrontal cortical activity relative to the hippocampal theta rhythm. Hippocampus 2005; 15: 867-873. Wang GW, Cai JX. Disconnection of the hippocampal-prefrontal cortical circuits impairs spatial working memory performance in rats. Hippocampus 2006; 7: 397-402. Harms KJ, Dunaevsky A. Dendritic spine plasticity: looking beyond development. Brain Res 2006; 4: 94-98. Tashiro A, Yuste R. Regulation of dendritic spine motility and stability by Rac1 and Rho kinase: evidence for two forms of spine motility. Mol Cell Neurosci 2004; 26: 429-440. Ona B, Julia JU, Aimin J. Spinophilin participates in information transfer at immunological synapses. J Cell Biol 2008; 4: 203-211. Afia A, Daniel C, Anne BR. Stereologic estimates of total spinophilin-immunoreactive spine number in area 9 and the CA1 field: Relationship with the progression of Alzheimers disease. Neurobiol Aging 2008; 29: 1296-1307. Yu J, DeMuinck ED. Endonthelial nitric oxide synthase is critical for ischemic remodeling, mural cell recruitment, and blood flow reserve. Proc Natl Acad Sci USA 2005; 102: 10999-11004. Casper KL. Progress of NO and iNOS in the study of ischemia. Lab Animal Sci Manag 2006; 23: 42-46. Wang Q, LI H. Effects of aminoguanidine and baicalein on cerebrovascular remodeling in a rat model of diabetes mellitus. Chinese J Gerontol 2014; 34: 1537-1540. Zhang HX, Zhang JX, Li LF. Mechanism of protective effect of aminoguanidine on experimental cerebral ischemic injury in rats. Chin J Pharmacol Toxic 2006; 20: 281-287.